womans backpack purse is made of lightweight soft vegan leather with stylish studs accessories, and nice printing lining inside. 1 compartment, perfect size for 13 inches macbook. Meanwhile you can put your books and other essentials. Outer: 1 front zip pocket. 2 slip pockets on both sides which can hold water bottle and umbrella. 1 safety rear zip pocket to hold your wallet and 5.5" cell phone. Interior: 1 large size slip pocket and 1 zip pocket. 4.Strap: Adjustable shoulder straps and 1 top handle. 5.Occasion: The fashion and roomy backpack purse is perfect for daily pack, work, casual, travel, school, campus and shopping. Backpack purse, mateirial is vegan faux leather which is high-quality that looks like real leather. 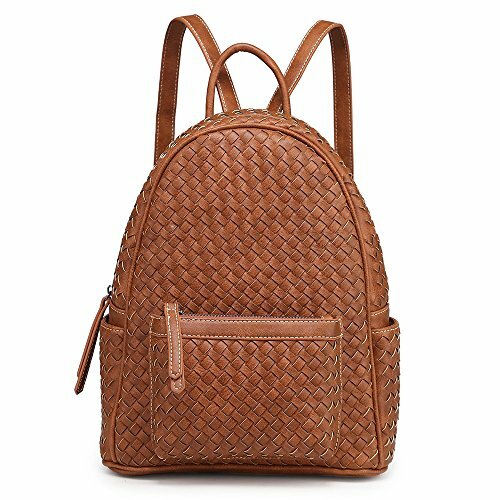 Design: 100% handmade woven pattern backpack will never go out of fashion. Adjustable shoulder strap,front zip pocket, rear zip pocket, side open pocket, interior slip pocket and zip pocket. If you have any questions about this product by Shomico, contact us by completing and submitting the form below. If you are looking for a specif part number, please include it with your message.